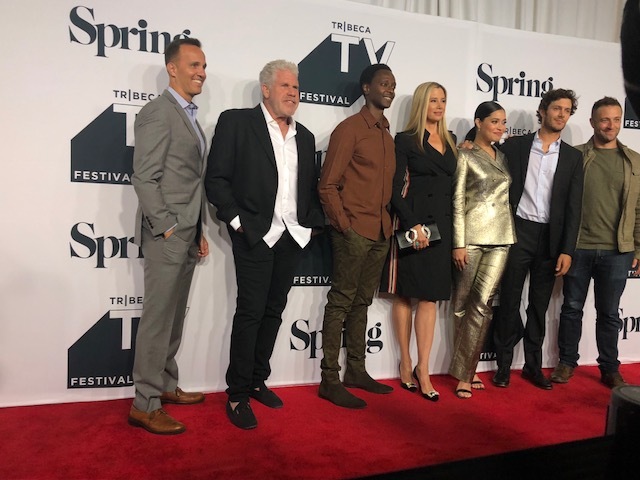 The stars descended on the 2018 Tribeca TV Festival for day two at Spring Studios in New York City. Spirits were high as longtime friends Meryl Streep and Tracey Ullman, star and Executive Producer of HBO’s Tracey Ullman’s Show, posed for photographers, then joined by Tracey’s pregnant daughter Mabel on the red carpet. Bradley Whitford, Lamorne Morris, and Steve Zahn were on hand to celebrate the world premiere of their new buzzed-about series Valley of the Boom from National Geographic. The cast of Sony Crackle’s StartUp, including Adam Brody, Edi Gathegi, Mira Sorvino, and Ron Perlman, reunited on the red carpet as well. Friday also saw the Midnight Episodics screenings of three late-night pilots, including Shudder’s Deadwax, created by/Executive Produced by Graham Reznick and EP Peter Phok; Pagan Peak, created by Cyrill Boss and Philipp Stennert; and Blackpills’ Patricia Moore, created by Blake Fraser and produced by Chris Thompson. “You are the first British woman to have her own sketch comedy show to air in the UK and the US,” Meryl continued, “and another fun fact from Wikipedia, is that you are… wait I have to read this… you are the richest of female comedians and actors in England. And I’m taking YOU out to dinner? Why?” The audience roared with laughter. Meryl closed with, “We are so lucky that you have such an incredible imagination, desire, heart, soul and you put it all out there and marry it with politics. You need to run for president.” As they hugged on stage, Tracey closed with “I love you Meryl. You’re my great, great friend.” The audience screamed and applauded for them both. Ron Perlman followed with, “we can’t even figure out if the Supreme Court nominee is a scumbag because of the false information we’re getting. If we can’t answer that how can I answer your question.” The audience laughed in response. Breanne Heldman from People moderated a panel with creator Matthew Carnahan, cast members Bradley Whitford, Steve Zahn, Lamorne Morris, and real-life subject Stephan Paternot, founder of TheGlobe.com. Steve Zahn said that his character is insanely amazing--he was blown away by the script but, “I was petrified to take on the role. I had to just dive in,” he confessed. Cecile Dubois and 2 others upvoted this.